Navigation >> NLP Techniques » Neuro Linguistic Programming? Download our free infographic What is NLP? What is NLP? 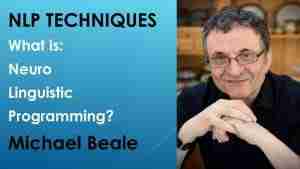 Michael Beale explains in this video. What is NLP? is a question many people ask. NLP stands for Neuro Linguistic Programming. This is a modelling approach that offers a toolkit of techniques for dealing with life’s opportunities and challenges. It is a very pragmatic discipline, concerned with bringing results into the real world. Therefore, NLP is the study of what works, and the context in which it works. 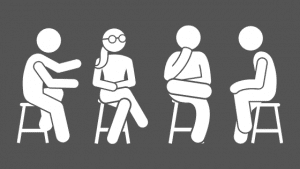 What do the words Neuro Linguistic Programming mean? Neuro means relating to the nervous system. Our neurological functioning is influenced by the information we take in through our senses. The more accurately we take in information: the better we listen, the more observant we are, and the the more open we are to our own and others’ feelings, the better information our brain has to make decisions and furthermore, to communicate more effectively (both consciously and unconsciously). Linguistic is about language. The more we understand and are aware of language – the words themselves, together with their structure, and the way they’re spoken (speed, voice tone, rhythm) so the more information we have when making decisions and communicating consciously and unconsciously. Programming here refers to habits. We develop habits, some useful, some less useful. NLP teaches us how we can develop and encourage useful habits and reduce less useful habits. NLP says that we create our own reality. One key NLP belief is that we all build our own maps of reality. These maps, or worldviews, are filtered by our senses, experiences, beliefs, and neurology. In other words, many of the challenges we have are based upon our perceptions of the world, not the world itself. Similarly: mental maps and worldview, cognitive dissonance and confirmation bias. Therefore, if we can improve the way we take in and use sensory information then we can improve our performance. NLP allows us to add structure to the otherwise abstract world of the senses. We have to notice, to listen and be aware of what (and how ) people see, hear and feel. Understanding our senses and their effect upon ourselves and others helps us to develop useful strategies for guiding behaviour. Great NLP is about leading and guiding ourselves and others. It is not about telling, tricking or forcing; it is about exploring what is constructive for both parties. “NLP is an exploration of how we think, communicate and act. It’s how we can emulate and improve upon great performance across a wide range of activities, and then transfer what we’ve learnt to others”. How people benefit from NLP Training and NLP Coaching. Connecting to their purpose, values and motivation. Having more successful and fulfilled lives. Improving performance at work, and starting and building companies. Achieving better relationships at work and at home. Overcoming blocks and continually learning new skills. And in many cases enjoying their hero’s or heroine’s journey through life. What attributes are needed to explore and learn about NLP? You don’t need any special skills to explore NLP. We’ve found that an attitude of curiosity, playfulness, fierceness and tenderness are really useful. In addition, when looking for results during coaching, a touch of ambition, courage discipline and openness/honesty really helps. A brief history of NLP. NLP was created more than 40 years ago by Richard Bandler and John Grinder. They studied and worked with Milton Erickson, Virginia Satir and Fritz Perls – some of the most talented psychiatrists and therapists of the day. Contrary to the majority of the academics at the time, however, they took a different approach in that they focused on bringing about measurable change, rather than merely theorising. Bandler and Grinder wanted to know the psychological strategies great performers used – what they did and how they did it. They devised means for modelling these strategies so others could replicate their performance. This became the initial model of NLP. Subsequently, the model was continually tested and refined with their clients. As different groups heard about its benefits it spread across a whole range of human endeavours, including coaching, art, sport, and business.